Another group, Al-Itisam Bil-Kitab wal-Sunnah, was one of the splinter movements that emerged from the Islamic Union. The focus here is on movements that had the most powerful and direct impact on political developments in Somalia. The civil war and the lack of centralised state institutions and especially military and security institutions contributed to forming fertile soil for takfiri jihadist groups that exploited the rampant poverty and frequent famine in the country to spread their influence in Somali society. The Islamic Union, or Al-Ittihad Al-Islamiya (AIAI), which arose in the early 1980s out of an alliance between the Islamic Youth Organisation and the Gamaa Islamiya, initially operated as a peaceful proselytising organisation that was politically opposed to the regime led by president Siad Barre. However, it later evolved into a militant organisation that became a party to the armed conflict that erupted following the collapse of the Somali government and state in the early 1990s. As the AIAI’s activities spread throughout the country, many parts of society came under the influence of its ideology, which combined fundamentalist notions with Muslim Brotherhood dogma and Wahhabi intolerance and aimed to establish an Islamic emirate in Somalia and expand it across the Horn of Africa or “Greater Somalia”. The AIAI also developed relations with other radical Islamist groups, such as Al-Qaeda in Afghanistan, as it stepped up its activities locally, especially in the Ogaden region, precipitating escalating confrontations with Ethiopia. In 1997, Ethiopian forces expelled the Islamic Union from the Ogaden region and destroyed its bases after accusing it of damaging security and stability in the Horn of Africa and East Africa region. After sustaining a series of military losses, the organisation’s leadership moved to Mogadishu where it fell into infighting and divisions. Because of its military setbacks, the movement’s old guard decided to renounce violence and re-assimilate into Somali society. The decision was rejected by the younger generation, however, which split off to create what would become an even more radical and violent organisation. As a Salafist movement that aims to create a state ruled by a strict interpretation of Sharia Law, the Shabab established links with Al-Qaeda through connections with the latter’s leaders in East Africa as well as through Somali returnees from Afghanistan. In spite of the fact that the Shabab managed to control around 80 per cent of the territory in central and southern Somalia from 2007 to 2011, it lost the popular and tribal support it once enjoyed when it fought Ethiopian forces because of its strict interpretation and implementation of Sharia Law, including by enforcing penalties such as public amputations, stonings, lashings and executions. Eventually, the peacekeeping forces of the African Union (AU) Mission to Somalia (AMISOM) succeeded in driving the Shabab out of Mogadishu and Kismayo. Although the Islamic State (IS) group tried to penetrate the Shabab and win its allegiance, as it did with Boko Haram in Nigeria, the majority of Shabab members rejected this bid. The overtures did, however, trigger rifts, especially among the Shabab units in control of the north of the country. In October 2015, their leader, Sheikh Abdul-Kader Moemen, declared allegiance to IS and posted a recording of this on social networking sites, prompting Washington to add his name to its list of international terrorists with the designation “IS leader in East Africa”. The Shabab organisation has several sources of funding, the most important of which are donations from Somali merchants, tribal leaders and ideological sympathisers abroad. Some Shabab members have engaged in extensive commercial activities themselves. Previously, it financed itself from the revenues of piracy, arms and drugs-smuggling and sales, and from the Kismayo port when it was under its control. The movement has sustained numerous ruptures and schisms, especially following the death of Ahmed Abdi Godane. Perhaps the most damaging rupture was that of Mokhtar Robow, aka Abu Mansour, the Shabab’s former deputy leader and spokesman, who, together with a group of his fighters, surrendered to the authorities in August 2017. He subsequently fought Shabab forces in Hudur in the Bakool region, with the Somali government giving him military aid so he could sustain the fight. Abu Mansour’s secession was preceded by many others. Given that tribal affiliations prevail over religious ones in Somalia, a breakaway commander often takes with him large numbers of his aides and disciples, most of them from the same tribe. Such ruptures could eventually severely weaken the movement, especially given that many splinter groups either join forces with the government to fight the Shabab or offer to cooperate with US counter-terrorist agencies stationed in the Horn of Africa and East Africa. 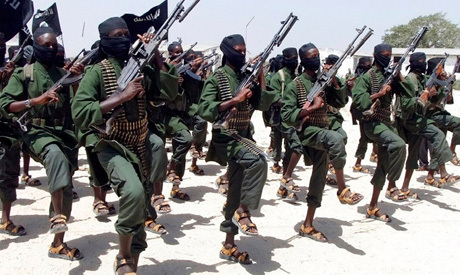 Ideological ruptures in the Shabab often trigger armed clashes, such as that which occurred after Moemen declared allegiance to IS and took with him some 300 fighters. Shabab forces eventually drove him and his followers into hiding in the mountains. There are contacts between the Shabab in Somalia and Al-Qaeda in the Arabian Peninsula and Yemen (AQAP). The former took advantage of the waves of migration to Yemen before the current war in the country to infiltrate its members among the migrants and move some 600 fighters per month from the East African coast to the Arabian Peninsula. The Shabab also has links with Al-Qaeda in the Islamic Maghreb (AQIM) and with the Al-Qaeda affiliate Boko Haram. The Shabab has staged numerous terrorist attacks in Somalia both against Somali government targets and against foreign interests. The suicide car-bombing near a crowded market in Mogadishu in October 2017 was one of the most atrocious attacks ever seen in Somalia, claiming more than 570 casualties. In 2016, the organisation attacked the Kenyan military base in Al-Adde in southwestern Somalia, killing more than 100 Kenyan soldiers, taking many of them prisoner, and seizing large quantities of munitions. The government of Somali President Mohamed Abdullahi Farmaajo, which came to power in January 2017, has pursued several avenues in order to tackle the problem of the Shabab. It has worked to rebuild the Somali military and its combat capacities in collaboration with international and regional powers involved in the war against terrorism, and it has facilitated and bolstered AMISON’s efforts to combat the group during the time it takes to reconstruct the Somali armed forces. As Washington prepared to launch offensives in different parts of the world in retaliation against the 11 September 2001 attacks, one of its chief goals was the need to uproot terrorism in Africa and to prevent the continent, long a victim of political instability and civil warfare, from serving as a safe haven for terrorist groups. Among the actions Washington took to fight terrorism in cooperation with East African governments was the launching of the East Africa Counter-Terrorism Initiative (EACTI) in 2003. In addition, it rented a military base in Djibouti and stationed 3,000 US troops there, created a multinational joint counter-terrorism task force, promoted intelligence exchange among the countries of the region, and furnished them with logistical and technical support for their own operations. The US counter-terrorism strategy has had detrimental repercussions on the countries and peoples of East Africa, however. In the course of combatting terrorism, little attention has been paid to the need to address the factors that are conducive to terrorism, including security breakdown, porous borders, rampant poverty and disease, social and economic injustice, and the marginalisation of minorities. As a result, counter-terrorist measures in East Africa have not succeeded in eliminating groups suspected of terrorism. Jihadist and takfiri groups continue to exist in Somalia, some affiliated with Al-Qaeda and others with IS. Observers of developments in Somalia note that cultural values in the country are informed by utilitarian interests, as the Somalis, as a consequence of geography and history, primarily engage in either commerce or agriculture and animal husbandry. Tribal affiliations come second in their scale of priorities, and these have increased in importance since the collapse of the state in 1991. Third in importance come religious affiliations, in view of the fact that 100 per cent of the population is Sunni Muslim. The assertion that thousands of foreigners have enlisted in the Shabab organisation seems unrealistic precisely because of the traditions and behavioural patterns of Somalia reinforced by security conditions that make this a closed and suspicious society. The areas of the country that fall outside of government control are also extremely dangerous, not just because of the conflict and the violence but also because of widespread disease, including cholera. Under such conditions, any significant foreign presence would be quickly detected and reported to the authorities. Counter-terrorism forces and agencies also keep close tabs on terrorist activities and carry out frequent raids and airstrikes against terrorist lairs and training camps. It follows that Somalia does not lend itself as a safe haven to foreign jihadist operatives fleeing counter-terrorist military operations in Afghanistan, Syria and Iraq. However, this does not preclude the existence of some foreign elements from Yemen, Libya or elsewhere in North Africa, for example, or from some of the Sub-Saharan African countries. *The writer is an expert in national security affairs.